Today my Darling wife and I walked along the river Thames up to Teddington Lock. In stark contrast to last weekend, sunshine was intermittent and not a drop of rain or snow… Puddles were fewer than normal and the air was crisp. Along the river signs of the new season are all jockeying for position – for me the most endearing of them all was a fiercely sung duet between two robin redbreasts. What a song! We marvelled at the fact that whilst we humans keep slogging ourselves relentlessly in the City with our 24/7 mad rush schedules, Nature is quietly (sometimes noisily!) going about it’s business. Crocuses and daffodils abound and leaf buds are swelling rapidly. Sure, we hear remarks about the never ending winter… We’re almost in April and still have to wrap up – when will it finally push on? After our relaxing yet invigorating walk today I can confidently predict it’s already happening! Birds, plants and the animals are singing it to us. At Teddington a sign caught our attention and sent my mind racing… Thanks to my Love’s nifty photography skills I can share it. This sign caught my attention and sent my mind racing! I can tell this year I’ll be “practising my casts” in the Thames more than ever in the hope of meeting and releasing my first sea trout – wouldn’t that be a refreshing headline in the papers? A MASSIVE thank you to all the unsung heroes who toil so hard to keep the Thames in wonderful condition. Wherever you are on Earth, let’s continue to play our part in it’s ongoing restoration and preservation! Thanks for reading, please visit again soon. 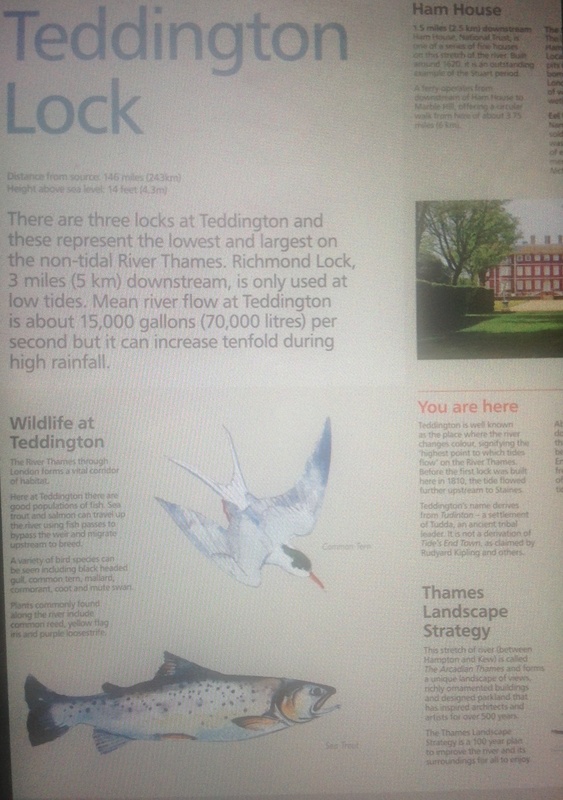 This entry was posted in Fishing, Fishing humour, Fly casting, Fly fishing, Fly tying videos, nature conservation, Uncategorized and tagged Biodiversity, Easter, London, Preservation, River Thames, Teddington Lock, Thames. Bookmark the permalink.